Up until yesterday, lots of upcoming goodies were displayed here for everyone to enjoy! This figma will included with the TV Anime Black Rock Shooter Blu-Ray Box & DVD Box. Anyways, that was a long introduction, but onto today’s main review! ：／　..:─::::: ＼： ”Huh? Are they multiplying? That’s right! 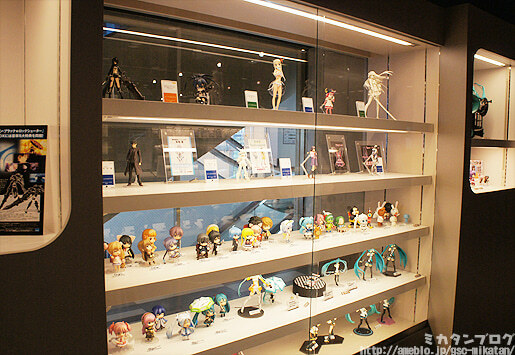 There were a whole bunch of new characters revealed at WonFes! But let’s look at them each in the sets they will be sold in! Set #1 : Makochi, Haruka-san & Yayo! From ‘Puchimasu!’ a spin-off IDOLM@STER manga currently being serialized in Dengeki Maou comes a set of figures of the cute miniature idols creatures, here to join the Character Charm series! I’ve already introduced these three on my blog before! They are up for preorder, so you can order your’s right now! Now for the main set that will be announced next! Set #2 : Chicchan, Miura-san & Io! Each charm is about 3cm high! So they are in fact very tiny! Perfect as charms, but still very detailed for their size… just look at the details on the paintwork for Io’s clothes! Chicchan’s braided hair is incredible! And the other two have such long hair you can’t even see they are stranding up! I wanted to shout out all these things in the cafe, but I managed to restrain myself… 😛 All the figures stand on their own without any stands – something that I love to see! Playing with them on the table! They’re so very small and cute to look at! And still fantastically sculpted! Just look how tiny her glasses are. They are also very easy to carry out with you whereever you go! The 3rd set are these four! Koami and Komami look so cute!! Not to mention Chihyaa! I can’t wait to get my hands on them! Set #2: Chicchan, Miura-san & Io!